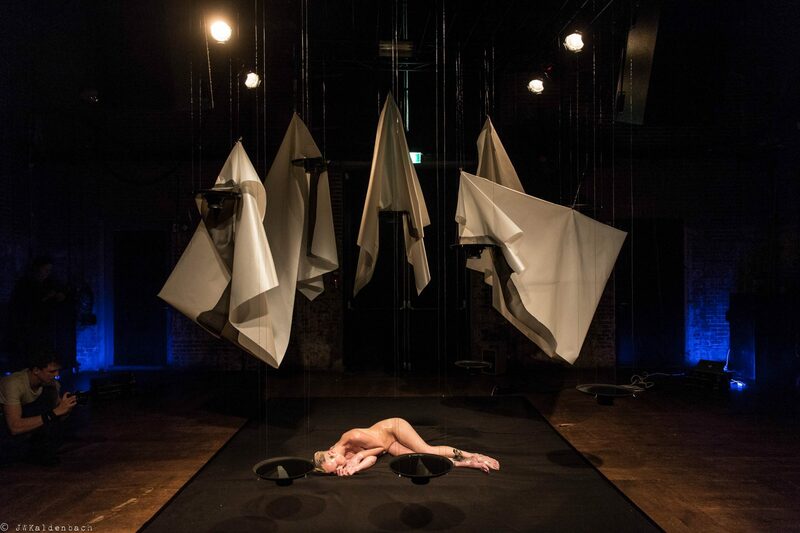 In this installation ‘Material Environment Mediation‘ during Mercedes-Benz Fashion Week Amsterdam 2016 we, Barbara Langendijk (fashion designer), Jochem Esser (fine artist) and Lisette Ros (conceptual performer), question how to define fiction and reality. The type of medium, through which we perceive things, determines our experience. Clothing, a designed combination of pieces of cloth, is a medium. The way we perceive clothing connects to the identity of the wearer and the identity of the garment. The way in which we experience data depends on what kind of medium is used. The sound you will hear during the performance comes from an external source. This is being transformed into a signal and transported by water. The sound will be different through different media, so what can ultimately be defined as the ‘real’ sound? The installation is a mix of several media. What defines fashion when a piece of cloth is not wrapped around a body? What is reality and what is fiction within the installation and within the world surrounding us? Which of these are pre-conceived and activated by technology and which arise spontaniously, in present time, in ‘reality’? Are we, as humans, with our inability to think in an abstract way (our brain works with associations), able to define what is real and what is fiction?